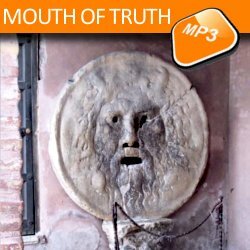 Description: Located in the porch of the lovely medieval church of Saint Mary in Cosmedin since 1632, the mouth of the truth (Bocca della Verità in Italian) attracts thousands of visitors every year. Its name and popularity derive from an old medieval legend stating that if a liar had placed his hand in its mouth, it would have been bitten off. It became even more popular when a very charming but mostly brave Gregory Peck tested the Mouth in front of a really scared Audrey Hepburn in a classic Wyler's movie: Roman Holiday.